It was supposed to be quick and fun. Instead, it took more than an hour and inspired some… er… colorful language. If you are using ingredients from the natural foods aisle (eg, not C&H powdered sugar), sift everything really well. I used powdered sugar from Wholesome Sweeteners and powdered milk from Organic Valley. Both of these clump up as a general rule but it’s never been a problem with other uses, although those usually involved a mixer. No amount of stirring was able to get this stuff to a completely smooth dough. So what? 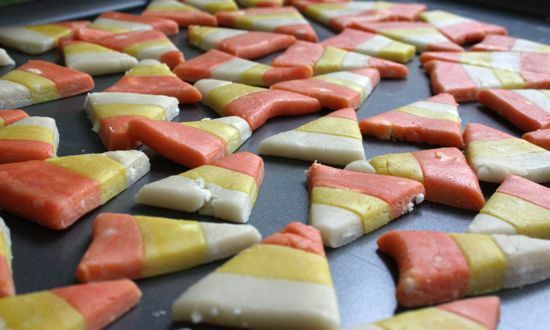 If the dough isn’t completely smooth, it’s a pain to roll out into the long snakey things that is a necessary step to get the traditional three color combination of candy corn. There’s a lot of hands-on in getting the candy into it’s final shape. If you wait until it’s well and truly “cool enough to handle”, it’s firmed up too much. The arm strength needed to roll out the snakes and then squish them together with a rolling pin is more than I have. If you have them, consider some sort of gloves to protect your hands from the heat and get the dough moving before it cools down. I’m not sure if the trouble I had getting the three colors to fuse together nicely was a result of the dough having cooled too much or if it had been toughened up due to excessive handling. But I had to wet the sides of my colored snakes of dough to get them to stick, sort of, most of the time. If you have one, use a kitchen scale to get your dough division even. I ended up with more orange than the other colors. Using “mainstream” sugar may result in a whiter white. My Wholesome Sweeteners Sugar produced a white that’s really more tan. And better food coloring might result in brighter colors. I had generic food coloring (usually used around here for coloring eggs) and some higher quality cake decorating colors may produce more vibrant candy. Roll your colored snakes out to much less than 1/2 inch in diameter. 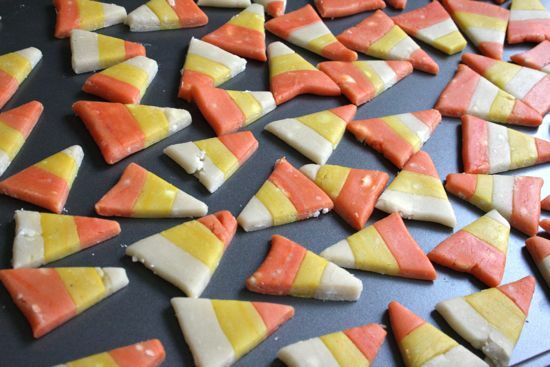 You’ll end up with final candy corn that’s a bit more reasonably sized. Otherwise, the recipe is really straightforward, without unusual ingredients. If you’ve got sugar, powdered sugar, powdered milk, corn syrup, vanilla and butter on hand, you can do this. It doesn’t even need a candy thermometer. And it’s pretty tasty stuff. You are amazing! It looks like home-made, organic food looks – way more 'real' and 'natural' than picture-perfect factory food. Bravo . . .